The sweet bean sauce is slowly cooked with onion and pork to create an appetizing and mouthwatering savory sauce. Add a spoonful of sauce to the noodles and gently mix them; you will smell the pungent aroma and be unable to resist picking up the chopsticks and digging in. 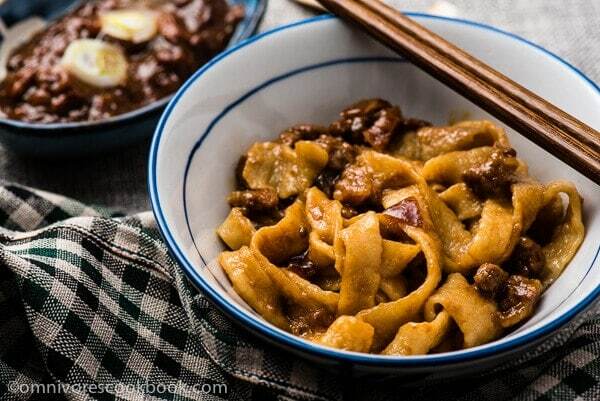 Fried Sauce Noodles (Zha jiang mian, 炸酱面) is one of the most classic and famous dishes in Beijing cuisine. Although not as fancy as Peking Duck, if you travel to Beijing, locals will always recommend this dish to you. Originally, fried sauce noodles was a dish for poor people. It uses a thick soybean sauce, which is very salty and cheap, to make the sauce, together with a bit pork and lard. 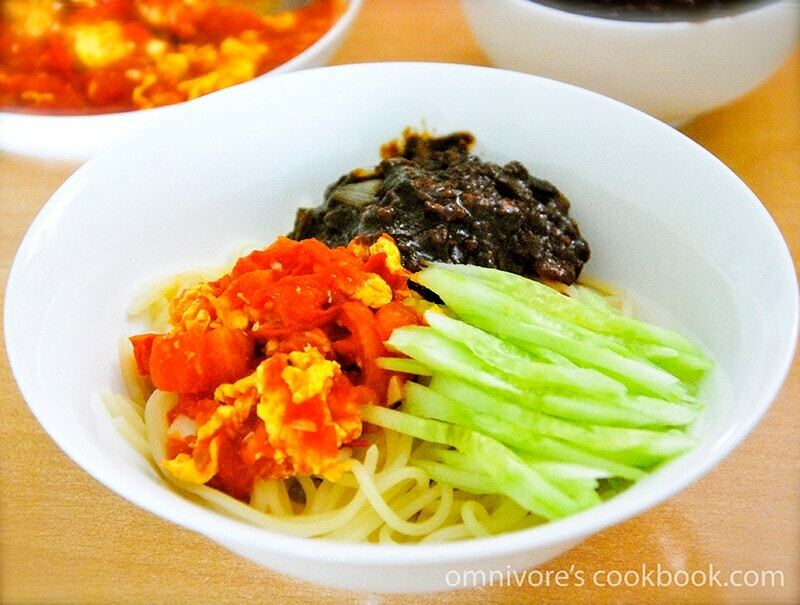 The sauce becomes so rich and flavorful that you only need a small amount of it to accompany a whole bowl of noodles. This way, people don’t need to spend much to fill up their stomachs. Although it seems like a simple dish, it has a whole set of rules that govern how it’s served in Beijing. It is called Old Beijing Fried Sauce Noodles here, and this is considered the most traditional and authentic way to prepare the dish. 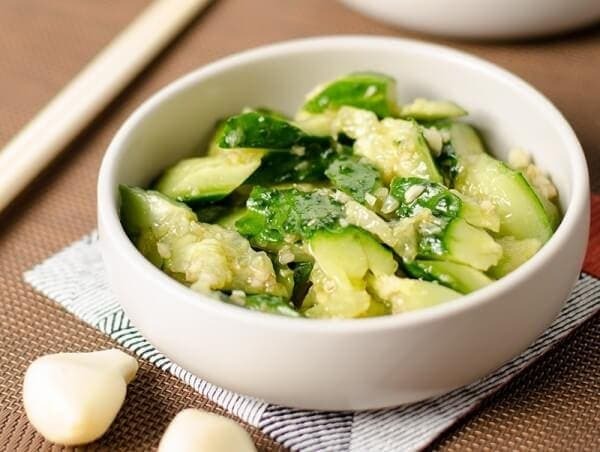 In addition to the sauce made from yellow soybean paste, the dish is also served with sliced cucumber, sliced red radish, boiled bean sprouts, and yellow soybeans. By adding all these things to the noodles, you can create a flavorful sauce that is refreshing and balanced in nutrition. However, the recipe I’m sharing today is different from the traditional way of cooking Zha Jiang Mian. This is a family recipe that was passed from my grandma, and it tastes even better than the traditional one. Instead of yellow soybean paste, we use sweet bean sauce (Tian mian jiang, 甜面酱), which is less salty and has a slightly sweet flavor (It is the same sauce that accompanies Peking Duck, by the way). It has a more delicate flavor and is less overwhelming than yellow soybean paste. Also, we usually chop the pork into small cubes instead of using ground pork, to achieve a better mouthfeel. In the end, we use a lot of onion, rather than Chinese scallion. The onion will make a great base and addssome sweetness to the sauce, just like it does for a Bolognese sauce. To serve the noodles, my family likes to pour stir fried egg and tomato on top. 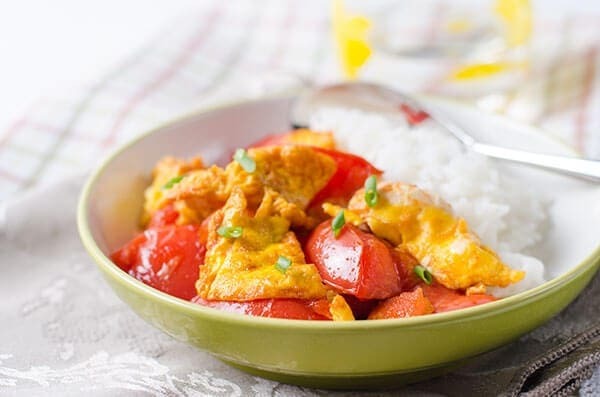 It goes perfect will the sauce, balances its saltiness, and makes the dish colorful. 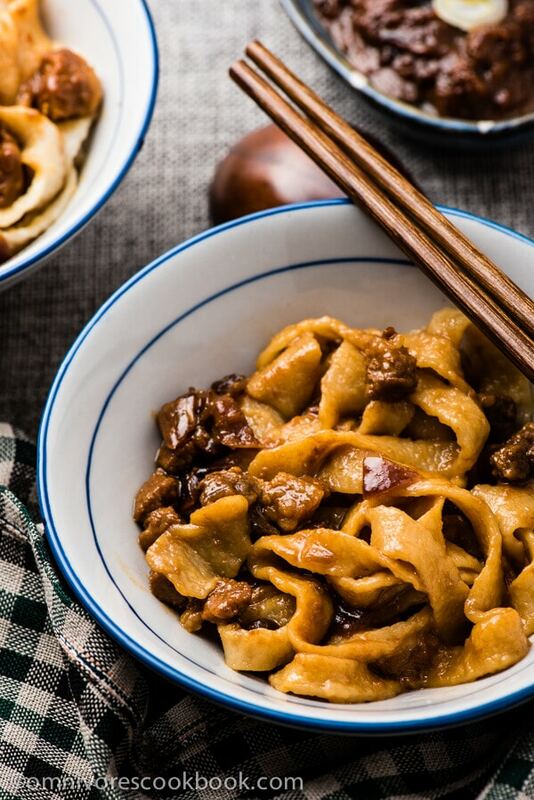 In summary, the dish not only preserves all the deliciousness of a bowl of traditional Zha Jiang Mian, but also tastes better and is super comforting. Ready to cook yet? Add minced pork, ginger and Shaoxing wine into a large bowl. Mix well. Add sweet bean sauce to a medium sized bowl. Slowly blend in water and stir constantly, until water is fully incorporated. Heat a wok (or a heavy bottomed skillet) over medium high heat. Add oil and wait until oil is hot, 2 to 3 minutes. Add pork and stir constantly, until the surface turns mostly white. Swirl in sweet bean sauce. Turn to medium heat and keep stirring constantly, until the sauce turns almost black, about 10 mins. If the sauce thickens too quickly and starts to feel like it’s sticking to the bottom of the wok, slowly blend in warm water, 1/2 cup at a time. Reduce the heat if the wok gets too hot. Add onion into the sauce and keep stirring, until fully cooked but still crisp, 3 to 5 minutes. Stop heat and transfer the sauce to a large bowl. Bring a large pot of water to a boil and cook noodles according to instructions. Add noodles to serving bowls. 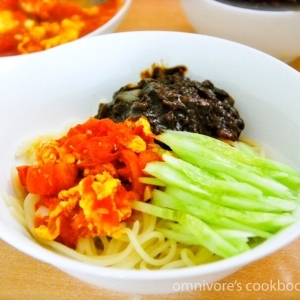 Top noodles with sauce, cucumber, and stir fried tomato and egg. This recipe generates about 4 cups fried sauce. Store leftovers in fridge for 1 week or in freezer for up to 1 month. 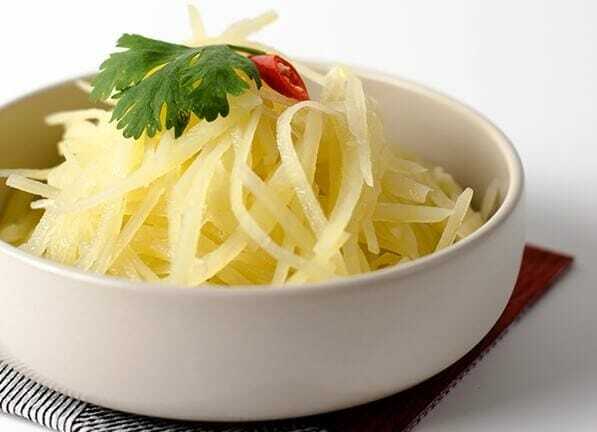 You can also serve noodles with just the sauce or with other stir-fried vegetables. All that sauce is making me drool! This noodle dish looks SO good Maggie. Had this for dinner tonight. Very good ! My husband liked it. Can you think of other dishes than this and Peking Duck? This is originally a Korean dish. Actually it’s originally a Chinese dish brought to Korea by the Chinese. You can ask any Korean about it. They do cook it differently though. Made it for lunch today. Didn’t have sweet bean sauce, so we used regular bean sauce. Also used dried udon noodles which turn out well. Delicious and perfect for early summer! Thank you Maggie! Hi Ervina, thanks for the comment and I’m so glad to hear you enjoyed the dish! Yes regular bean sauce is totally OK to make this dish. In fact it is more commonly used in China. Our family prefer a bit sweeter taste and that’s why we use the sweet bean sauce.